Dickson is on a knife edge. At time of writing, 50.01% to the sitting Liberal member. Twelve votes in it with 84% counted. Wow. Some of the happier news is that my area, Mt Nebo, is about the leftiest place on Earth. We’re by far the leftiest place in the electorate, anyway: 77.68% voted left on a two-party-preferred basis. Next best is around 60% in Bray Park and Strathpine. If you’re really curious, load up this .csv file into a spreadsheet and sort the votes; it shows the 2pp votes by polling place for the whole country. Sad thing? Over 1600 informal votes, which would have easily swung the result one way or the other. Everyone out there in Dickson who said their vote didn’t make any difference just missed a trick. Inspired by this page, exploring alternative readable mini-calendars, I’ve produced one. 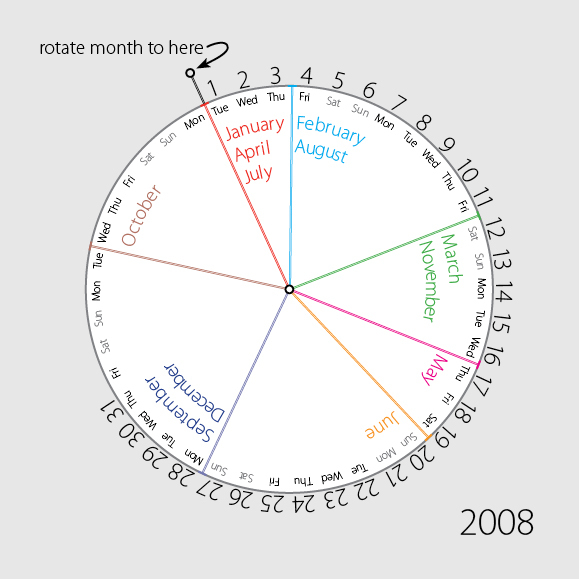 I was surprised that nobody had submitted anything inspired by a rotating perpetual calendar — so I had to make one. The central white part spins around a pin at the centre. There are space savings if they’re needed, but this is 105x105mm. WOOOOOOOOHOOOOOOOOOOOOOOOOO! Antony Green has cautiously given Labor the election. Channel 9 has given Labor the election with an exclamation mark. It hasn’t been claimed yet, but our champagne is open, flowing, and tasting great. Quick! Snap up this bargain property in Sydney’s Kirribilli. Vote. If you’re going to vote like me. I’d been looking forward to the release of Valve’s The Orange Box for Xbox 360 since, as a long time Mac guy, I’ve never played Half Life 2. Sacrilege, I know, and I do like a good story-based shooter. Had a quick go. Great so far. A few weeks ago, this review singled out Portal for praise, and Yahtzee doesn’t give praise lightly. So I rented it last night with a view to purchase, and played Portal from start to finish. It’s the best fun I’ve had with a game in ages: clever, rewarding, different, challenging and very, very funny. To know more would ruin the fun, so grab a copy and play it. Rent it just for Portal (360, PC) if you’re not into first person shooters. You won’t shoot anyone and you don’t have any bullets; it’s a first person puzzle. Portal is not long, but it’s brilliant. How did I not know about Cut & Paste? Edit: Well, watching the webcast now and it’s very disheartening to see obviously sub-par entries win over much more accomplished work. Repeatedly. Gah. I’ve figured out how to get near-instant stereoscopic 3D movies in Motion 3. Download this Motion file which has several settings about right. Activate the horizontal two-up view (the second option in the View Layouts menu under the Timing button). You may need to assign the cameras to the appropriate panes for a cross-eyed view (left on the right, right on the left). Command-option-/ hides the 3D view info, so hide it in each pane. Now go cross-eyed to unify the two panes into a true stereoscopic 3D view. You can’t press play, because only the active pane will update. You can step frame-by-frame. You can drag the playhead. Enjoy! If you really enjoy, discuss, or comment here. Note to self: try to create a visual bubble graph like this next time I need to represent some data. Made a new Twelve Fives vid. Forgot to tell you. Enjoy!